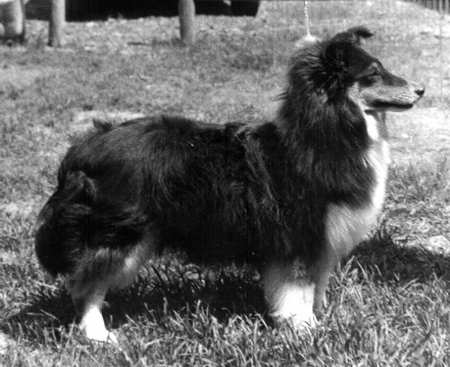 Once upon a time (in the '60's) there was a young Sheltie enthusiast who learned all she could about this wonderful breed and with her new husband traveled to many important Sheltie kennels. They were especially impressed with two bloodlines, Sea Isle and Pocono. On researching the pedigrees of these kennels they noticed an important link, a small kennel called Shelt-E-Ain. Ch.Nashcrest Golden Note, the leading Sea Isle sire was out of Nashcrest Rhythm, an inbred daughter of Shelt-E-Ain Pirouette by Shelt-E-Ain Little Sir Echo (her son by that day's greatest sire, Ch. Timberidge Temptation). Ch.Shelt-E-Ain Reflection O'Knight, the sire of Ch.Blue Heritage of Pocono and other great Pocono Shelties, was by Ch.Shelt-E-Ain Black Knight a full brother to Rhythm and out of a Pirouette daughter by Ch.Genairn Devil May Care (Temptation son). Thus they traced to intense breeding by a small breeder not noted as a major Sheltie kennel yet producing important foundations for both lines the Curtises admired. This fact gave them courage to hope that working on a small scale (wisely limited by the advice given them by Millers of Pixie Dell to concentrate on their children) they could produce Shelties worthy to carry on the breed they loved. After many trials and errors Calcurt was finally fortunate enough to be able to purchase from Trudy Mangels of Brandwyne Collies, the beautiful Sheltie Silver Talisman of Pocono (Bobbie). This double grandson of Ch.Blue Heritage of Pocono with the most perfect head planes (flat, balanced, clean- have yet to see better) combined with a really sweet disposition that made him a joy to live with, formed the foundation for their Pocono side. He earned his CD while Calcurt was active in obedience. An interesting note for you pedigree fans is that fact that while with Trudy, Silver Talisman sired the blue merle female Brandwyne Sugar Blue from Ch.Whitwood's Dark Secret. She figures in Banchory breedings as the dam of Banchory Born Free II (by High Born) who produced Ch.Banchory Billie Holiday (by Thunder Blue) and her full sister Banchory Blue Velvet who produced Excaliber Turn Em On (by Ch.Cherden Sock It To 'Em). Bred to Thunder Blue, Turn Em On produced Banchory Excaliber Elite and her sister Banchory Excaliber Ecstasy who bred to (Ch)Banchory Formal Notice ROM produced Ch.Banchory Thousands Cheered. What this all leads to is the fact that Ch.Banchory Peerless ROM and his daughter Ch.B'Field True Colors,CD HC ROM both trace directly to Silver Talisman through Thousands Cheered and the Peerless son Ch.Tall Timber Far Out Frisco ROM traces to Silver Talisman twice since his dam is also a grandaughter of Thousands Cheered. Finally purchased after futile attempts to get a good tricolor girl, Ch.Lingard Blue Heather (Silver), a blue Reflection grandaughter joined Calcurt's Sheltie family. She reinforced the dark almond eye factor with increased refinement overall. Silver produced some quality Bobbie kids including a promising tricolor male who was sold as a pet because we were busy with our toddler children. Fortunately Calcurt was able to use him for breeding so Black Laird of Calcurt CD, became Angie's sire. The Sea Isle side of our line came through Shelties purchased from Marge Barry of Jomar. Topo Gigio was a lovely son of Badgerton Red Riot of Carmylie CDX, a Ch.Sea Isle Serenade (inbred Note) son. His mother was a daughter of Ch. Lindhurst Comanchero and Ch.Kawartha's Fair Game. Topo was so loved by a friend of ours that we let her take him and she got his championship. You can now see a picture of Topo under Calcurt Scarlet Ribbons Lass in 2004. Jomar's Happy Miss Tam was a pointed Red Riot grandaughter with Katie-J's Twinkling Starlight (Tam) a Golden Note daughter we were fortunate enough to live with for a while. Both Tams had exceptional movement, a steady smooth trot that carried them effortlessly. Happy Miss Tam's sire was full brother to Topo's mom by Ch.Lindhurst Comanchero and Ch. Kawartha's Fair Game tripling the elegant Ch.Teaberry Lane's Little Pecos and bringing in more Ch.Sheltieland Kiltie O'Sea Isle (that Note/Kiltie blend so successful at the time). The Topo-Tam litter was born just after the birth of our second child. Fortunately the pick female, Calcurt Molly Fitchett came back to us later and produced Angie in her litter with us. So although too late for our dear Silver Talisman we finally had the tricolor Sheltie we had tried so hard to find. And her first litter by the young Sea Isle linebred Peter Pumpkin which consisted of four boys, Matthew Mark Luke and John (in order of birth) took us that step like Tobi Ain before. We will always be grateful to Tom Coen and Steve Barger for recognizing and promoting Luke's quality. From our family's point of view, if you note Angie's birth date as 1970, our daughter and second child was born January 1969 so she grew up with Angie. Angie was very much Virginia's dog. Virginia graduated from High School in June 1986 so Angie almost made it. Many of Angie's puppies were born and raised in Virginia's bedroom. As our two children became very busy with school activities and we live in a rural area 20 miles from their school, the Shelties took second place. But Angie was always the grand lady and queen in our household.